If you would like a free Banner Link to your site in the “Our Friends” Section of our links page please first provide a link to us on your site using the code below, or similar. Once your link is in place and we can verify it with Google Back-links, please contact us with details of the url of your link and your banner/graphics. 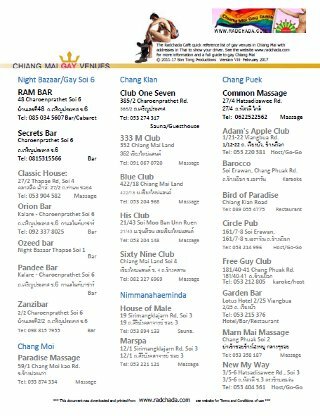 Including links is absolutely at our discretion and we only accept links from bona fide gay organisations or from gay businesses in Thailand. We won’t place links to pornographic content. Note preferred width for banners is 234 Pixel width, banners that aren’t will be scaled to suit. Please send your banner using the form at the bottom of this page. Please use this form to send us a banner for linking. Upload your banner. Recommended size is 234x 60 px.